The U.S. Senate's Judicial Committee's Subcommittee on the Constitution, led by Sen. Ted Cruz (R-TX), hosted a hearing, titled "Stifling Free Speech: Technology Censorship and the Public Discourse," which addressed whether social media giant Twitter and other tech companies are censoring conservative speech, including the hit pro-life movie UNPLANNED. 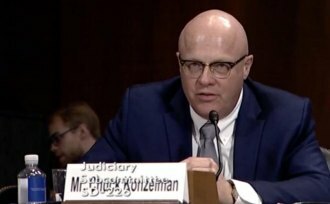 Chuck Konzelman, co-director/producer/writer of UNPLANNED, will testify before the committee. Mr. Carlos Monje, Jr., director of public policy and philanthropy in the U.S. and Canada for Twitter; Neil Potts, public policy director for Facebook; Dr. Francesca Tripodi, assistant professor of sociology at James Madison University; the Honorable Marilyn Musgrave, vice president of government affairs for the Susan B. Anthony List; Robbie Parker, father of a Sandy Hook Victim; and Eugene Kontorovich, professor of law at the Antonin Scalia Law School, George Mason University, also will testify. ABOUT UNPLANNED - Abby Johnson was Planned Parenthood's superstar. In eight years, she rose from college volunteer, to one of the youngest clinic directors, to Employee of the Year ... then she assisted with an abortion. The inspiring new film - UNPLANNED - traces Johnson's journey from staunch abortion advocate to standing side-by-side with the people who prayed for her spiritual transformation and facing the full, head-on attack of one of the most powerful organizations on Earth.